Police today put all officers on the lookout, and asked the public to be on the lookout, for a red car who’s teenager driver has been accosting young girls walking in Centralville. On at least one occassion the driver exposed himself to a young girl. 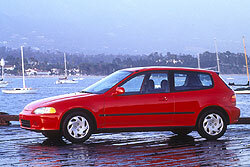 So far most of the incidents have occurred between 6 and 8 a.m., and involve the driver of a red car, possibly a 1994 Honda Civic hatchback, similar to the one shown in this picture I found on the web. Police say they so far have four similar reports, from Nov. 27, Dec. 3, Dec. 7 and today, that a white, teenaged male with scruffy, messy hair, possibly a lip ring and freckles, pulling up alongside young girls and trying to make conversation. At times the conversation is sexual in nature, police said. Anyone with information on this person, or who spots this person, is asked to call Lowell Police at 978-937-3200 immediately. Police would very much like to speak with him. After reporting yesterday on a terrible crash on Andover Street in Lowell, I learned tonight about strikingly similar crash that claimed the life of a Billerica woman in Austin, Texas last week. Kristen Corbett, 20, of Billerica, was killed when her car failed to negotiate a curve on a road in Austin just before midnight Wednesday night. She struck a tree. Police say they believe she was speeding, and that she was not wearing her seatbelt. Those are exactly the circumstances of Sunday’s fatal crash in Lowell. Corbett was even driving the same model of car as Stephen Clark, 22, of Tewksbury, who was killed in the Lowell crash – a Nissan Altima. I talked to Kristen’s father tonight and she sounds like she was quite a girl. I’ll have a lot more about her in tomorrow’s paper, and possibly a lengthy follow-up on Wednesday. Those at Clark’s home asked for privacy when another reporter reached them today. Tewksbury Police are shutting down Main Street in front of Smitty’s Liquors, 1091 Main St., as we speak because a vehicle just hit a utility pole and split it in half. Reports are that the vehicle’s occupants are out and walking around, so apparently no serious injuries, but it sounds like the pole is a mess and wires are down. Might want to avoid the area if you’re heading that way for some weird reason at 10:45 p.m.
Reports now that there is a wire on the car, so they can’t even more the car until National Grid shows up. Police say National Grid isn’t expected on scene for about 20 minutes, so the road will probably be closed for a while. Police say a 22-year-old Tewksbury man was killed today when his Nissan Altima went off Andover Street, left no skid marks, and slammed into a large tree next to the inbound lanes just before Holbrook Avenue, about 11:09 a.m.
A couple neighbors told me they heard the crash, but I couldn’t find anyone in the neighborhood who witnessed it. Lt. Timothy Crowley, who oversees the traffic bureau, said it appears the driver got distracted for a second while going around the slight curve to the left. Crowley said speed may be a factor, and at the speed police think the driver was going, it only would have taken a second to leave the road and hit the tree. The tree still had a large mark on it from the impact tonight. It’s over 2 feet thick. No word on an identity yet, police are still trying to make sure all family members have been notified. The driver was stuck in the car for about 30 minutes, and firefighters had to cut off the roof and door to get him out. He was taken to Saints Medical Center, where he was pronounced dead. Lisa Redmond has a pretty funny story on today’s front page about people fighting traffic tickets in area courts. One thing that caught my eye was a guy saying he thinks Lowell has quotas, but I’ve certainly never heard that they do. The traffic patrol details that Superintendent Lavallee has pushed at the LPD have certainly led to a pretty serious crackdown on motor vehicle offenses, though. And the folks working those details don’t mess around. The number of traffic citations in Lowell has tripled since Lavallee took over, so if you think you can zip around the city playing fast and loose with traffic laws, expect to get nailed sooner or later. They’ve even gotten me twice. First was over a year ago, when, like a girl mentioned in Lisa’s story, I had gone a while with an expired inspection sticker. Unlike the girl in the story I hadn’t forgotten, but I went a few months with a rejection sticker because I just couldn’t afford the necessary repairs. A traffic enforcement officer caught me on the Lord Overpass and wrote me up. Honest to God, I was on my way to Lowell Automatic Transmission, about 200-yards away, to finally get my new sticker when I was stopped. I told the officer that, but since I had been expired for several months it didn’t get me anywhere. A few months later an officer got me on Route 110 going under the Hunts Falls Rotary. Did you know the speed limit there is only 35? I thought it was 45, and was definitely speeding since I was heading toward a report of a rollover accident on Haverhill Street in Dracut. Worst thing about that ticket is that not only did the officer not care that I was rushing to an accident, the accident ended up being extremely minor, no one hurt, and no rollover. That trip didn’t have 35 cents worth of news value, nevermind over $100. Folks should watch themselves in Lowell, though. There might not be quotas, but Lowell Police are extremely serious about cracking down on drivers. This time on Hancock Avenue, right off Salem Street in the Acre. Police got the call at 10:24 p.m., and found a red Ford Explorer with a shot through the driver’s side window, the driver’s door, and the rear driver’s side tire. Here’s the holes in the window and door. At lhree shell casings in the street. No people struck and no witnesses that I know of, though there is a Housing Authority camera nearby that police hope caught the suspects on video. No word on whether this could be related to the other incident tonight. I missed most of this because I was off at the shooting, but firefighters got called to 24-26 Swift St., in Back Central, tonight about 7:50 p.m., because building owner Elze Scandorierro was watching television in her first-floor bedroom when she smelled smoke. Everyone got out alright, and firefighters were able to contain the fire to the first-floor room of origin, according to Deputy Chief Patrick McCabe. It appears the cause was electrical in nature. No one was hurt. McCabe said power to the building would have to be cut, though. Scandorierro said she lives on the first floor with her husband, two children, two grandchildren and someone else. A husband, wife and child live on the second floor, and a husband and wife live on the first floor.